Boomerang’s mission is to measure all aspects of the user’s experience, while not affecting the load time of the page or causing a degraded user experience in any noticeable way (avoiding the Observer Effect). It can be loaded in an asynchronous way that will not delay the page load even if boomerang.js is unavailable. While it is impossible for Boomerang to cause zero overhead, Boomerang strives to be as minimal and lightweight as possible. If we find any inefficiencies along the way, we will investigate alternatives to improve the library. You can skip down to the TL;DR at the end of this article if you just want an executive summary. Boomerang is an open-source library that is maintained by the developers at Akamai. mPulse, the Real User Monitoring product from Akamai, utilizes a customized version of Boomerang for its performance measurements. The differences between the open-source boomerang.js and mPulse’s boomerang.js are mostly in the form of additional plugins mPulse uses to fetch a domain’s configuration and features. While this audit will be focused on mPulse’s boomerang.js, most of the conclusions we draw can be applied to the open-source boomerang.js as well. This audit will be done on mPulse boomerang.js version 1.532.0. While Boomerang captures performance data for all browsers going back to IE 6 and onward, this audit will primarily be looking at modern browsers: Chrome, Edge, Safari and Firefox. Modern browsers provide superior profiling and debugging tools, and theoretically provide the best performance. Modern browsers also feature performance APIs such as NavigationTiming, ResourceTiming and PerformanceObserver. Boomerang will utilize these APIs, if available, and it is important to understand the processing required to use them. Where possible, we will share any performance data we can in older browsers and on slower devices, to help compare best- and worst-case scenarios. For more information on any of these plugins, you can read the Boomerang API documentation. With that, let’s get a brief overview of how Boomerang operates! The Boomerang Loader Snippet is placed into the host page. This snippet loads boomerang.js in an asynchronous, non-blocking manner. The browser fetches boomerang.js from the remote host. In the case of mPulse’s boomerang.js, this is from the Akamai CDN. On startup, Boomerang initializes itself and any bundled plugins. mPulse’s boomerang.js then fetches config.json from the Akamai CDN. At some point the page will have loaded. Boomerang will wait until after all of the load event callbacks are complete, then it will gather all of the performance data it can. Boomerang will ask all of the enabled plugins to add whatever data they want to the beacon. Once all of the plugins have completed their work, Boomerang will build the beacon and will send it out the most reliable way it can. We recommend loading boomerang.js using the non-blocking script loader pattern. This methodology, developed by Philip Tellis and others, ensures that no matter how long it takes boomerang.js to load, it will not affect the page’s onload event. We recommend mPulse customers use this pattern to load boomerang.js whenever possible; open-source users of boomerang.js can use the same snippet, pointing at boomerang.js hosted on their own CDN. The non-blocking script loader pattern is currently 47 lines of code and around 890 bytes. Essentially, an <iframe> is injected into the page, and once that IFRAME’s onload event fires, a <script> node is added to the IFRAME to load boomerang.js. Boomerang is then loaded in the IFRAME, but can access the parent window’s DOM to gather performance data when needed. You can review the current version of the mPulse Loader Snippet if you’d like. Notably, async and defer remove the <script> tag from the critical path, but will still block the page’s onload event from firing until the script has been loaded. Boomerang strives to not affect the host page’s performance timings, so we don’t want to affect when onload fires. Other events such as domInteractive and domContentLoaded are also delayed. This script creates a <script> node on the fly, then inserts it into the document adjacent to the first <script> node on the page. The work being done in the snippet is pretty minimal, but this code needs to be run in a <script> tag in the host page, so it will be executed in the critical path of the page. We can see that most modern devices / browsers will execute the non-blocking loader snippet in under 10ms. For some reason, recent versions of IE / Edge on a fast Desktop still seem to take up to 66ms to execute the snippet — we’ve filed a bug against the Edge issue tracker. On older (slower) devices, the loader snippet takes between 20-40ms to execute. Let’s take a look at profiles for Chrome and Edge on the PC Desktop. Here’s an example Chrome 62 (Windows 10) profile of the loader snippet in action. We can see that the loader snippet is more expensive in Edge (and IE 11) than any other platform or browser, taking up to 50ms to execute the loader snippet. In experimenting with the snippet and looking at the profiling, it seems the majority of this time is caused by the document.open()/write()/close() sequence. When removed, the rest of the snippet takes a mere 2-5ms. We have filed a bug against the Edge team to investigate. We have also filed a bug against ourselves to see if we can update the document in a way that doesn’t cause so much work in Edge. If the overhead of the loader snippet is of a concern, you can also defer loading boomerang.js until after the onload event has fired. We don’t recommend loading boomerang.js that late, if possible — the later it loads, the higher the possibility you will “lose” traffic because boomerang.js doesn’t load before the user navigates away. We have example code for how to do this in the Boomerang API docs. We are currently experimenting with other ways of loading Boomerang in an asynchronous, non-blocking manner that does not require the creation of an anonymous IFRAME. You can follow the progress of this research on the Boomerang Issues page. Now that we’ve convinced the browser to load boomerang.js from the network, how is it actually fetched? For all of these reasons, we encourage the Boomerang Loader Snippet to be as early as possible in the <head> of the document and for boomerang.js to be served from a performant CDN. For mPulse customers, boomerang.js is fetched via the Akamai CDN which provides lightning-quick responses from the closest location around the world. According to our RUM data, the boomerang.js package loads from the Akamai CDN to visitors’ browsers in about 191ms, and is cached by the browser for 50% of page loads. Note that because of the non-blocking loader snippet, even if Boomerang loads slowly (or not at all), it should have zero effect on the page’s load time. 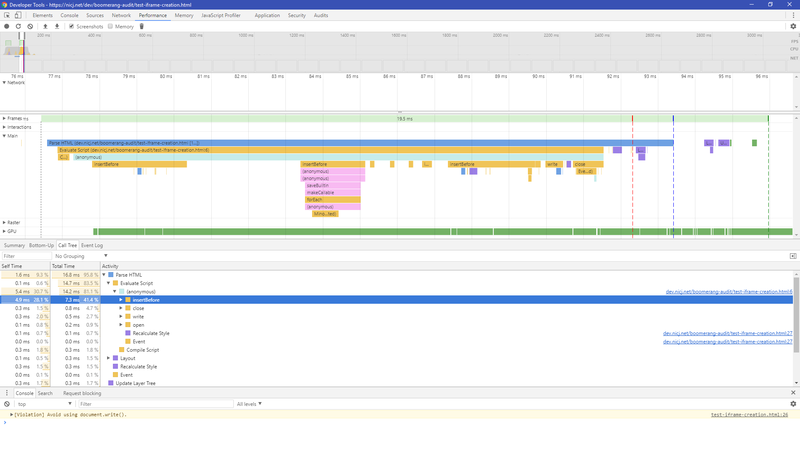 The Cache-Control header tells the browser to cache boomerang.js for up to 7 days. This helps ensure that subsequent visits to the same site do not need to re-fetch boomerang.js from the network. For our mPulse customers, when the boomerang version is updated, using a 7-day cache header means it may take up to 7 days for clients to get the new boomerang.js version. We think that a 7-day update time is a smart trade-off for cache-hit-rate vs. upgrade delay. For open-source Boomerang users, we recommend using a versioned URL with a long expiry (e.g. years). Using these headers, we generally see about 50% of page loads have boomerang.js in the cache. We are planning on adding support for Brotli (br) encoding. This will reduce the transfer cost of boomerang.js to about 25% of its original size. The Timing-Allow-Origin header is part of the ResourceTiming spec. If not set, cross-origin resources will only expose the startTime and responseEnd timestamps to ResourceTiming. We add Timing-Allow-Origin to the HTTP response headers on the Akamai CDN so our customers can review the load times of boomerang.js from their visitors. boomerang.js generally comes packaged with multiple plugins. See above for the plugins used in mPulse’s Boomerang. The combined source input file size (with debug comments, etc) of boomerang.js and the plugins is 630,372 bytes. We currently use UglifyJS2 for minification, which reduces the file size down to 164,057 bytes. Via the Akamai CDN, this file is then gzip compressed to 47,640 bytes, which is what the browser must transfer over the wire. We are investigating whether other minifiers might shave some extra bytes off. It looks like UglifyJS3 could reduce the minified file size down to about 160,490 bytes (saving 3,567 bytes), though this only saves ~500 bytes after gzip compression. We used YUI Compressor in the past, and have tested other minifiers such as Closure, but UglifyJS has provided the best and most reliable minification for our needs. As compared to the top 100 most popular third-party scripts, the minified / gzipped Boomerang package is in the 80th percentile for size. For reference, Boomerang is smaller than many popular bundled libraries such as AngularJS (111 kB), Ember.js (111 kB), Knockout (58 kB), React (42 kB), D3 (81 kB), moment.js (59 kB), jQuery UI (64 kB), etc. Enabling Brotli compression at the CDN. This would reduce the package size to about 41,000 bytes over the wire. Only sending plugins to browsers that support the specific API. For example, not sending the ResourceTiming plugin to browsers that don’t support it. For open-source users of Boomerang, you have the ability to build Boomerang precisely for your needs by editing plugins.json. See the documentation for details. There’s not a lot we can do to improve the browser’s parse time, and different browsers may do more work during parsing than others. The primary way for us to reduce parse time is to reduce the overall complexity of the boomerang.js package. Some of the changes we’re considering (which will especially help the slower devices) were discussed in the previous section on boomerang.js’ size. In general, the Boomerang core and each plugin takes a small amount of processing to initialize their data structures and to setup any events that they will later take action on (i.e. gather data at onload). Most modern devices are able to do this initialization in under 10 milliseconds. Older devices may take 20-80 milliseconds or more. In looking at various Chrome and Edge traces of the creation/initialization process, we’ve found a few inefficiencies in our code. Since initialization is done in the critical path to page load, we want to try to minimize the amount of work done here. If possible, we should delay work to after the onload event, before we’re about to send the beacon. In addition, the script currently executes all code sequentially. We can considering breaking up this solid block of code into several chunks, executed on a setTimeout(..., 0). This will help reduce the possibility of a Long Task (which can lead to UI delays and visitor frustration). The plugin creation and initialization is all done sequentially right now, and each could probably be executed after a short delay to allow for any other work that needs to run. So where are we at so far? The Boomerang Loader Snippet has executed, told the browser to fetch boomerang.js in an asynchronous, non-blocking way. On modern devices, this will take around 10-40ms. On slower devices, this could take upward of 160ms. What’s next? If you’re fetching Boomerang as part of mPulse, Boomerang will initiate a config.json request to load the domain’s configuration. Users of the open-source Boomerang won’t have this step. This file is fetched via a XMLHttpRequest from the mPulse servers (on the Akamai CDN). Browser are pros at sending XHRs – you should not see any work being done to send the XHR. Since this fetch is a XMLHttpRequest, it is asynchronous and should not block any other part of the page load. config.json might arrive before, or after, onload. The size of the config.json response will vary by app. A minimal config.json will be around 660 bytes (430 bytes gzipped). Large configurations may be upward of 10 kB (2 kB gzipped). config.json contains information about the domain, an Anti-Cross-Site-Request-Forgery token, page groups, dimensions and more. On the Akamai CDN, we see a median download time of config.json of 240ms. Again, this is an asynchronous XHR, so it should not block any work in the browser, but config.json is required before a beacon can be sent (due to the Anti-CSRF token), so it’s important that it’s fetched as soon as possible. This takes a bit longer to download than boomerang.js because it cannot be cached at the CDN. Note that the Cache-Control header specifies config.json should only be cached by the browser for 5 minutes. This allows our customers to change their domain’s configuration and see the results within 5 minutes. Once config.json is returned, the browser must parse the JSON. While the time it takes depends on the size of config.json, we were not able to convince any browser to take more than 1 millisecond parsing even the largest config.json response. After the JSON is parsed, Boomerang sends the configuration to each of the plugins again (calling BOOMR.plugins.X.init() a second time). This is required as many plugins are disabled by default, and config.json turns features such as ResourceTiming, SPA instrumentation and others on, if enabled. Modern devices spend less than 10 milliseconds parsing the config.json response and re-initializing plugins with the data. By default, for traditional apps, Boomerang will wait until the onload event fires to gather, compress and send performance data about the user’s page load experience via a beacon. Once the onload event (or SPA load event) has triggered, Boomerang will queue a setImmediate() or setTimeout(..., 0) call before it continues with data collection. This ensures that the Boomerang onload callback is instantaneous, and that it doesn’t affect the page’s “load time” — which is measured until all of the load event handlers are complete. Since Boomerang’s load event handler is just a setImmediate, it should not affect the loadEventEnd timestamp. The setImmediate() queues work for the next period after all of the current tasks have completed. Thus, immediately after the rest of the onload handlers have finished, Boomerang will continue with gathering, compressing and beaconing the performance data. PageParams handles domain configuration such as page group definitions. The amount of work this plugin does depends on the complexity of the domain configuration. ResourceTiming compresses all of the resources on the page, and is usually the most “expensive” plugin due to the compression. The profile looks largely the same the empty page, with more time being spent in ResourceTiming compressing the resources. The increase of 10ms can be directly attributed to the additional resources. Again, the profile looks largely the same as the previous two pages. On this page, 25ms is spent compressing the resources. We will investigate ways of reducing this work on mobile devices. Boomerang and its plugins are getting/setting the page’s cookie several times during the page’s lifecycle. In most browsers, getting and setting the cookie is a semi-expensive operation, since it often involves reading or writing state to the disk. We should investigate if all of these gets/sets are necessary and combine/eliminate any extraneous ones. The ResourceTiming plugin is often the most expensive plugin at onload. This is due to the compression we apply to ResourceTiming data, which can reduce the ResourceTiming payload to less than 10% of its original size. However, there are opportunities to make this compression more efficient. After all of the plugins add their data to the beacon, Boomerang will prepare a beacon and send it to the specified cloud server. As you can see, the ResourceTiming plugin dominates the beacon size. This is even after the compression reduces it down to less than 15% of the original size. Once the payload has been prepared, Boomerang queues the IMG, XMLHttpRequest or navigator.sendBeacon call. Browsers are pros at loading images, sending XHRs and beacons: sending the beacon data should barely register on CPU profiles (56 microseconds in the above example). All of the methods of sending the beacon are asynchronous and will not affect the browser’s main thread or user experience. The beacon itself is delivered quickly to the Akamai mPulse CDN. We immediately return a 0-byte image/gif in a 204 No Content response before processing any beacon data, so the browser immediately gets the response and moves on. Each of these plugins will have its own performance characteristics. We will profile them in a future article. In order to aid in monitoring Session Duration (how long someone was looking at a page), Boomerang will also attempt to send an unload beacon when the page is being navigated away from (or the browser is closed). Boomerang listens to the beforeunload, pagehide and unload events, and will send a minimal beacon (with the rt.quit= parameter to designate it’s an unload beacon). Note that not all of these events fire reliably on mobile browsers, and we see only about 30% of page loads send a successful unload beacon. In this example, we’re spending about 10ms at beforeunload before sending the beacon. Various plugins are reading/writing the cookie several times during unload. We could possibly coalesce them into one or two calls. The NavigationTiming unload handler is running, even if it already ran at onload. We may want to run it again to just populate the unload event timestamp, but we probably don’t need to re-run all of the code. The Memory plugin is updating node counts in the unload handler. This can take a few milliseconds, so we may want to avoid doing it. The PageParams plugin (mPulse) is running twice at beforeunload even if it ran at onload. We can probably skip some of its work. So at the end of the day, what does Boomerang “cost”? We’ve identified several areas for improvement. They’re being tracked in the Boomerang Github Issues page. If you can’t have Boomerang executing on the critical path to onload, you can delay the loader snippet to execute after the onload event. For open-source users of Boomerang, you can remove plugins you’re not using by modifying the plugins.json prior to build. 5. Why did we write this article? We wanted to gain a deeper understanding of how much impact Boomerang has on the host page, and to identify any areas we can improve on. Reviewing all aspects of Boomerang’s lifecycle helps put the overhead into perspective, so we can identify areas to focus on. We’d love to see this kind of analysis from other third-party scripts. Details like these can help websites understand the cost/benefit analysis of adding a third-party script to their site. I’d like to thanks to everyone who has worked on Boomerang and who has helped with gathering data for this article: Philip Tellis, Charles Vazac, Nigel Heron, Andreas Marschke, Paul Calvano, Yoav Weiss, Simon Hearne, Ron Pierce and all of the open-source contributors. One thing–understood that you wouldn’t benefit much from the multiplexing element of HTTP2, but wouldn’t it be desirable to take advantage of header compression? Yup! It will be good for us to move to H2 for that and other small possible perf benefits, so we’re hoping to enable it soon!